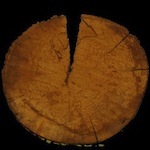 A Woodscratcher is a machine that cuts a 2.5cm thick disk of a tree-trunk in a circular fashion along the growth rings of the wood; Ritsch has placed 4 pick up microphones on 4 sides of the trunk and decided this is his going to be his main instrument of choice for this release. I am aghast at this album; nearly 40 minutes are taken up with the constant sound of wood being cut in a circular motion. This is artistic lunacy at its greatest and a complete waste of vinyl. Ritsch, should be quite frankly ashamed of himself for thinking this provides any worth in a world where actual talented musicians struggle to have their works released by any record label. I am also disgusted that any label would actually spend their budget on this piece of tripe and point my finger in the direction of the nearest mental institution, at anyone who parts with their hard earned cash on this appalling excuse for an album. This entry was posted in Godrec. Bookmark the permalink.